A writing colleague of mine sent me an interesting article recently; wanted my opinion on a piece written by a book blogger with a rather fierce agenda about who gets to call themselves an “author” these days. The piqued pontificator asserted that there are fundamental distinctions to be made between “author” and “writer,” nuances he deemed essential to preventing confusion in the literal and virtual book-buying marketplace. And here I thought readers just wanted to know which were the good books! According to our parsing pundit, the title of “author” applies only within this very limited parameter: a writer who makes a living with the books they write. Their full-time living. No side-jobs. No article writing, copyediting, babysitting; mowing of the neighbor’s lawn, or even the occasional catering gig. If there is any under-the-table commerce unrelated to the business of the book, well then, they are not an author. They are just a writer. Why that assignation—writer— is considered lesser, I do not know; but, apparently, it is. Obviously this semantical corralling would include most self-published authors—I mean, writers—because, except for the select few who’ve managed to self-publish their way to enviable fame and fortune, the rest are busy selling real estate, proofing web copy, or teaching grade schoolers while pursuing their passion on the side…and until they hit their literary jackpot. Our bitching blogger believes distinctions are to be made for these folks. But even if you agree with him, I have to ask: why should the distinction matter…to anyone? And yet it does. To that particular blogger and others I’ve encountered along the way. So much so that self-publishers who dare refer themselves as “authors” are likened, in some ways, to paralegals posing as attorneys, interns marching hospitals in doctor whites, or security guards puffed up like the NYPD Blue. In other words: pretenders, imposters, frauds. Really? The distinctions between writer and author are SO carved in stone as to allow the Word Police to pejoratively deny one group use of the more vaunted descriptive of author? Well, how ’bout we leave it to the dictionary? That seems clear. Shall we continue? Yep, as interchangeable as driver and motorist, teacher and educator; trapeze artist and aerialist. More importantly, did you note the first, most important definition of “writer”? According to the dictionary, it’s the writer who’s identified as the professional, not the author! Holy bloviating blogger, that drops the whole theory on its head! 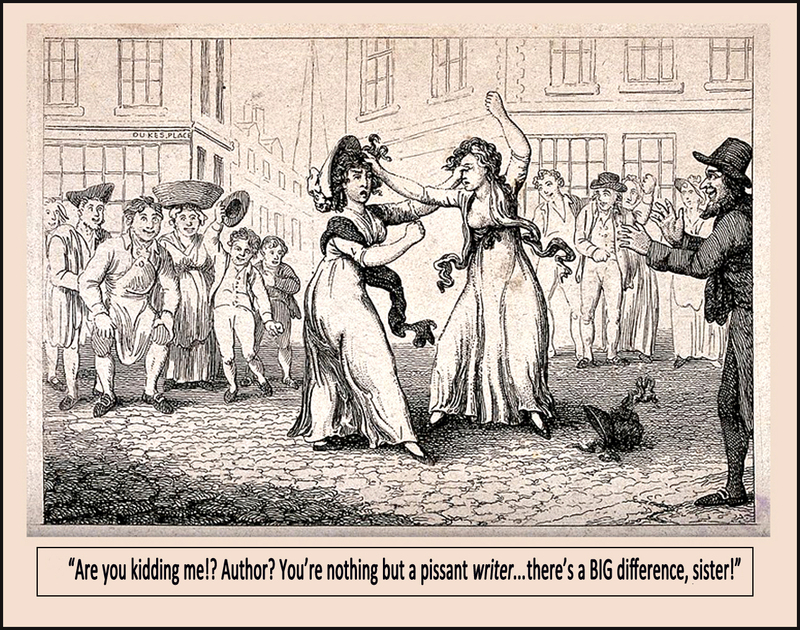 But while I poke fun at the condescension of said cynic and his ilk, the sad fact remains that they are emblematic of many who marginalize independent, self-published authors as dilettantes and amateurs, relegating them (sometimes literally) to card tables in the back room rather than up on the dais with the “real authors.” Fair? No. But the nose-snubbing endures. It likely began with the vanity press, that notorious business model that gave amateur writers the opportunity to publish their work for a fee. The narcissism of the option was presumed: anyone who would pay to have their own book made, a book they obviously couldn’t get published through professional means, must surely be a vainglorious sort. Forget that they might have just wanted a few copies to leave the family. But moving past vanity presses came the even more paradigm-shifting digital revolution, which first hit the music industry like a hurricane, forcing analogue studios into Pro Tools machines, and traditional record companies upside-down-you-turn-me. No one was sure how to adjust (it’s still a conundrum…see Taylor Swift and Spotify; see Apple and Spotify, see Spotify and Pandora…), but adjustments were and continue to be made. And artists who’d previously been kept outside the gates were suddenly making and selling their own, affordably recorded, music, while payment formulas, arcane to begin with, went up in smoke. No one knows how anyone’s making a living these days, but there’s lots of great music and many excellent (heretofore ignored) singers, songwriters, bands, and musicians who are finally able to get their work out there. That, alone, is worth a great deal to a great many. Are they, then—those scratching out a living however they can while playing gigs, hawking CDs, and keeping hope alive on the Internet—allowed to call themselves musicians, recording artists, bands, and so on? Of course! Because they actually are all those things. How they get their art produced and delivered, or how much money they’re able to accrue in the process, has zero bearing on their talent, skill, or the value and artistry of their work. Is it all good work? No. But it never was all good work, even when record companies were stationed like trolls at the gate. But much of it is astonishing music that would have never seen the light of day under the old regime. And now it’s the audience, the marketplace, that not only has access to many more artists by virtue of this democratization, but will be the arbiter of just how the supply and demand piece plays out. That same paradigm shift is happening in book publishing. Since sites like Amazon, Smashwords, Kobo, iBooks, IngramSparks and others have created platforms for independent authors to upload, publish, and sell their work, similar fears, criticisms, and condescensions have percolated. But just as those who naysay indie musicians tend to be backward travelers, so, too, are the curmudgeons who’d generalize, dismiss, and denigrate independent authors across the boards. Because the talent, skill, and artistry of authors is not based on whether or not they fit the narrow demands of publishers scrambling to stay relevant (or solvent); nor is it based on whether the sum total of dollars they’re able to earn is enough to cover their bills. No; the talent, skill and artistry of authors is based on…drum roll…the talent, skill, and artistry of each individual author. Period. 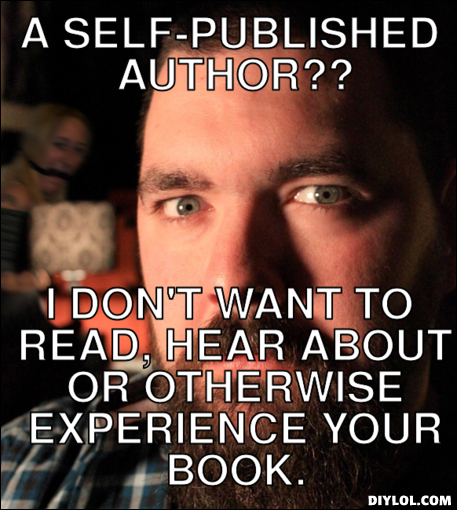 Is every book by a self-published author a good one? No, of course not. That’s been established. But many are as profound, as resonating, as any good book sitting on the shelf at Barnes & Noble. And, conversely, all one has to do is ferret through a book bin at CVS, peruse the racks at an airport, or consider some of the most viral of bestsellers put out by traditional publishers to find examples of the kind of drek that makes our blogger’s teeth grind. It’s past time for the media, the publishing industry, book stores, and cultural taste-makers to move beyond elitist, myopic attitudes about the clearly indefatigable self-publishing world. As that demographic evolves, the authors within it will raise their own bar to demand the highest standards from its members: constructive peer pressure designed to make sure the steps are taken, the funds invested, and the necessary work done to deliver the most excellent books possible. And what will happen then is that more and more of those authors will break through the barriers to slowly but surely make more money, get more attention, and find their way onto bestseller lists, award tables, Kindles, and bed stands of discerning readers. Because they are authors, just as the dictionary confirms: “writers creating original, literary works.” Which is exactly what self-published and independent authors have been doing all along. This was really great to read. I think it’s fantastic to respond like this to people who sit behind their keyboards and talk trash about others. Make them look the fool that they are. Every self-published AUTHOR should read this. Thanks, Ian. Given that you, too, are in this crazy end of the business, you’ve got inside perspective on this as well. The little ways in which some seek to belittle others seems so counterproductive and pointless to me. A better choice might be to simply applaud people’s creativity and leave it at that. Thanks so much for your comment. I think, quite frankly, that I should get a sort of 10% Finders Fee on that patent when you come up with it cuz you mentioned it here on my blog. Seems fair? 🙂 I agree, Tara; the people who need to don’t read or give a hoot about these things. Mostly I write them as a way to vent my own steam so it’s purely a selfish endeavor. Or perhaps a “preaching to the choir endeavor. But then, I’m an author — writer — author — writer (think Chinatown), so I’m clearly confused.